I don't know anything about the author, but I would go so far as to recommend this as the first book to read on the theme of social responsibility. 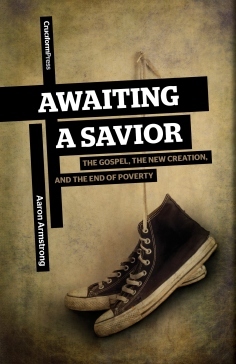 Aaron Armstrong's approach is just so right, starting with sin and its effects. Once there was no such thing as poverty - now it can never be eradicated. Note that poverty is a state of spiritual loss involving all Adam's descendants before it is an economic or relational one. A true christian is a person who has had a deep felt need, and found it met by God's grace through Jesus Christ. Grace given so freely, yet so incredibly undeserved! Never can such a person sit in judgement on the deservings or undeservings of his fellow men, whether down the street or on the other side of the globe. Compassion, kindness and generosity are foundational to a true christian. He must do as he has been divinely done by. Armstrong makes a careful distinction between this peculiarly christian ethic and that which drives other well meant but ultimately worldly initiatives. Christians are realists - there will never be a human led solution to human need, whatever resources are put into it. Such understanding avoids the common guilt trip response. However cynicism ('What can I do about it?') is thereby also overturned. How many opportunities there are and always will be to help the destitute, because they will always be here! The theology is thus soundly set out - in fact it occupies most of the book, with satisfying biblical backup. And this is necessary because so many go astray at the very start. Legalism (the 'default setting' of the fallen mind) in particular is a major danger. Hence in making his applications, including offering detailed thoughts on the subject of giving, Armstrong strongly emphasises the 'willing mind' acting out of love to God. I am pleased to have this book from Cruciform Press in stock now at £6.50, along with other titles from their ever increasing range.